1. Preheat the oven to 180˚C, gas mark 4. Toast the cumin in a dry frying pan for about 30 seconds, until fragrant; set aside. Add the peas to a pan of boiling water and simmer for 3 minutes until tender then drain well and tip into a food processor. Add the chick peas, cornflour, garlic, toasted cumin, tahini, ½ the parsley, ½ the mint and the lemon zest. Season and whizz to a rough paste. With wet hands, shape the mixture into 12 small patties. Line a large baking tray with parchment and arrange the falafel on it. 2. Brush the falafel tops with oil; bake for 25 minutes. Meanwhile, whisk together the lemon juice and olive oil in a bowl; season. Toss with the tomatoes and remaining herbs. Divide the tomato salad between 4 plates. 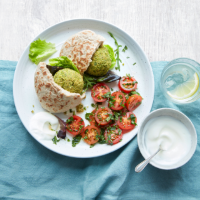 Serve the cooked falafel straight away, stuffed into a pitta with salad leaves and 1 tbsp yogurt each.